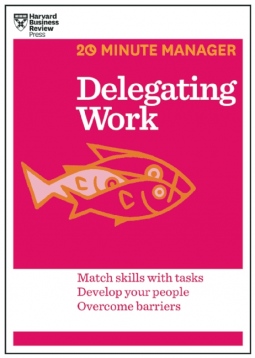 In this short introduction to delegating work you’ll learn of be confronted again the benefits of leverage work by involving others in the execution. Delegating work gives you and your team members opportunities to learn and grown, give and receive feedback and ultimately get things done more effectively and efficient. Get the time to focus on the things that require your expertise. Delegating Work quickly walks you through picking the right people, hand-over work and monitoring work without getting trapped in micromanagement (again). 20-30 minutes of your reading time may save you hundreds of costly hours afterwards and increase employee’s satisfaction. About Harvard Business Review‘s 20-Minute Manager Series: Don’t have much time? Get up to speed fast on the most essential business skills with HBR’s 20-Minute Manager series. Whether you need a crash course or a brief refresher, each book in the series is a concise, practical primer that will help you brush up on a key management topic.